I have gotten my hands on a handmade Diplomacy variant, however for the life of me I can't figure out which period it is supposed to represent. Of course the author had to take liberties when designing the map, but I would just like to know which generic period we're talking about. From the research I have done so far I think it's a late medieval period, but I am far from sure, to be honest. A notable feature of this map is the English possession of Western France, which means that it's no later than 1453, when France took Bordeaux. Since in the Diplomacy game you color only the ownership of "supply centers" (represented by circles on the map, the larger industrial/population centres) this is consistent with France owning Paris, Rouen and Dauphine and the rest of the provinces being "unimportant" - the same with Wales, as it's not a "supply center" then it cannot have an owner and it being without color does not imply Wales being independent from England. Another feature is an unified Denmark, Sweden and Norway, which happened from 1397 as Kalmar Union. This year is also consistent with a Castile without Aragon, possession of Kiev by Poland-Lithuania and Bulgaria owned by Ottomans. The only liberty taken seems to be a bit overly unified Germany-Brandenburg. 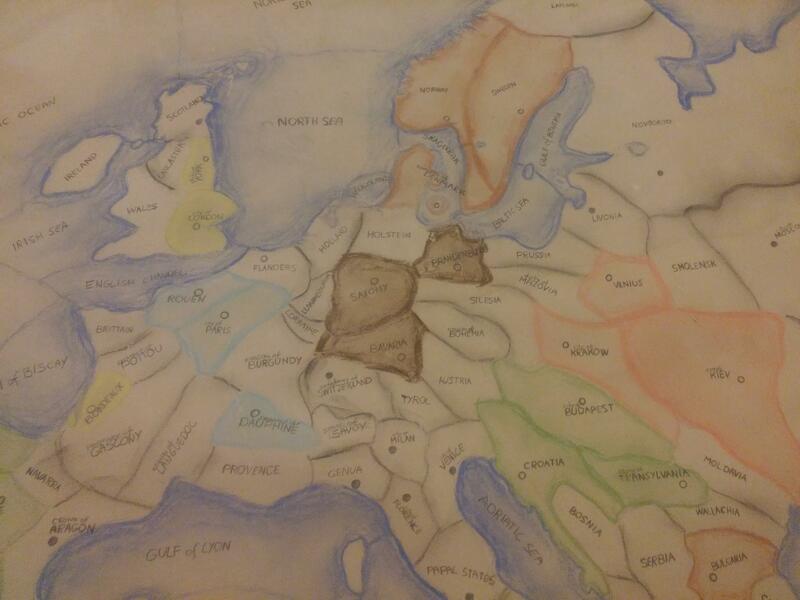 This map is not historically accurate. For example there is an entity called "Prussia" and an entity called "Novgorod", while in reality they never existed at the same time. It's a mixture of maybe 1500ish plus minus 200 years and a lot of artistic freedom. Not the answer you're looking for? Browse other questions tagged identification maps or ask your own question.